Anti-war campaigners have criticised Tony Blair after he suggested his decision to go to war in Iraq would ultimately be judged by God. The prime minister told ITV1's Parkinson chat show: "If you believe in God (the judgement) is made by God." Reg Keys, whose son was killed in Iraq, said Mr Blair was "using God as a get-out for total strategic failure" and his comments were "abhorrent". 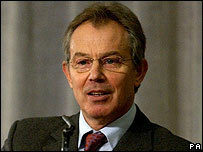 But Labour MP Stephen Pound praised Mr Blair for being "painfully honest". Mr Blair told Michael Parkinson, in an interview being screened on Saturday, how he had struggled with his conscience when making decisions about a potential war in Iraq. "When you're faced with a decision like that, and some of those decisions have been very, very difficult, most of all because you know... there are people's lives... and, in some case, their death," he said. "The only way you can take a decision like that is to try to do the right thing according to your conscience." He said: "I think if you have faith about these things, then you realise that that judgement is made by other people... and if you believe in God, it's made by God as well." When asked if he had prayed to God on the matter, he replied: "I don't want to go into that... you struggle with your own conscience about it... in the end, you do what you think is the right thing." Mr Keys, who stood in the 2005 General Election as an anti-war candidate in Mr Blair's constituency of Sedgefield, said religion had nothing to do with the Iraq war. "And the people who will be his judge is not God, it will be the families of the bereaved British soldiers and it will be the families of the bereaved innocent Iraqis who have all been slaughtered in this totally unnecessary conflict." Mr Keys' son, Lance Corporal Tom Keys, was one of six Red Caps killed by an Iraqi mob in Majar Al-Kabir in June 2003. Mr Keys, the founder of campaign group Military Families Against The War, said going to war had been a "catastrophic political blunder". He accused Mr Blair of "jumping on the same bandwagon" as US President George W Bush, who caused a storm after saying he decided to invade Iraq because he was on a "mission from God". "Are we really seeing over 100 coffins coming back (to the UK) because God told him (Mr Blair) to go to war?" Rose Gentle, whose son Gordon was killed in Basra in 2004, said: "A good Christian wouldn't be for this war. "I'm actually quite disgusted by the comments. It's a joke." Dr Evan Harris, a Liberal Democrat MP and honorary associate of the National Secular Society, said Mr Blair's comments were "bizarre" and warned against politicians making "references to deity" in public life. "This is the nearest we've seen for some time of Tony Blair admitting a little bit that his actions were guided by his own private religious faith." Mr Pound told BBC Two's Newsnight that Mr Blair was being "painfully honest" and, as he would not be seeking re-election as prime minister, his comments should be taken as apolitical. "If this was anything to do with trying to appeal to the electorate, he wouldn't be so excruciatingly honest," he said. "If he was trying to go that awful American route of guns, gods and gays and try to link politics to religion, then he wouldn't be doing it this way." Addressing a union conference in London on Saturday, Mr Blair made a joke about the reaction to his remarks. After saying he was sorry to have missed the opening address, the prime minister added: "I probably missed the prayers as well. That's a joke for the media."